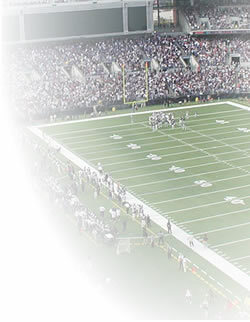 NFL Confidence pools are one of our most popular NFL formats. Not only must members pick the winning team, they must back up their pick by giving it a relative confidence ranking. It's a really fun football pool format but running one manually requires a lot of time and patience to crunch all those numbers. Why not let us do that hard work for you? Our customers like this format because is easy enough for a novice to enjoy, yet challenging enough for their members who are knowledgeable NFL football fans. No need to collect picks. Your members login to the website directly to make their picks. No more pick sheet errors. 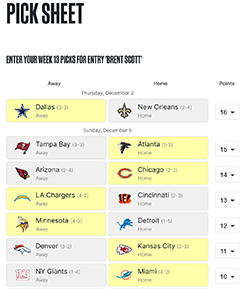 Our pick sheet prevents your members from forgetting to pick a football game or from assigning the same confidence points to multiple games. No more number crunching. Pool standings are automatically updated. Add your company or organization logo to customize the look of your Confidence pool. For more information, see our Brand Your Pool page. Every NFL Confidence pool hosted at RunYourPool.com includes a free, private message board. Your pool's message board, accessible only to your pool members, is a great way to communicate with members. Start your NFL Confidence pool with us today. If you have any additional questions, please contact us via email at sales@runyourpool.com. We're happy to answer any questions you may have.